ARTIST:	Peter O TITLE:	Colours EP CAT:	NT078 STYLE:	House, Deep House, Nu Disco :::::::::::::::::::::::::::::::::::::::::: Upfront Support: Maya Jane Coles, Catz ‘N Dogz, Kyodai, Martin Landsky, Shur-I-Kan, Halo, Mark Farina, Nutritious, Joris Voorn, Giom, Shadow Child, Mixmag (Mash), Smash TV, Waifs + Strays, Fish Go Deep, Brett Johnson, Joyce Muniz, Roberto Rodriguez, Tres Manos, Jason Hodges & more. [DJ feedback below] :::::::::::::::::::::::::::::::::::::::::: Out now at Beatport: www.beatport.com/release/colours-ep/1378520 :::::::::::::::::::::::::::::::::::::::::: A new addition to the Nordic Trax roster, we welcome Brighton producer and deejay Peter O on board with the Colours EP. A veteran of London’s early ‘90s warehouse scene, Peter has been releasing music since 2007. The four-track Colours EP moves from deep house to indie dance and builds upon his deep roots in house culture. While studying music technology & sound production at IMW in London, Peter co-promoted the Tabula Rasa & Monophunk parties. After fine-tuning his craft this quickly led to a string of releases with labels Tronicsole, Nightbird Music, De La Casa and Disclosure Project Recordings among others. He has worked with the likes of Monophunk, Asadinho, Alex Barck, Kris Wadsworth and J-Felix, who also appears on this ep. His work has also caught the attention of some notable music tastemakers including M.A.N.D.Y., Charles Webster, Lucidflow and Q Burns. The title track ‘Colours’ is a deep & moody tech house monster. Equally at home in a big room club set as an intimate late night party, the tension & release is beautifully executed over the 5 minute track leaving you wanting more. ‘Keep It Up’ & ‘Tea Time’ explore the more tracky elements of house for fans of Chicago and West Coast funky house. ‘Tea Time’ has a very classic deep house vibe, perfect for end of night / sunrise sets. On ‘Touch’ Peter collaborates with fellow Brighton musician J-Felix on the EP’s only vocal track. One for the disco lovers, J-Felix’s vocals float effortlessly over Peter O’s beats in this perfect sunset track. J-Felix is a UK musician releasing original material and touring as a guitarist, DJ, singer & producer. He’s toured as a guitarist for Alice Russell & has appeared on various compilations alongside DJ Vadim & Ta Ku among others. He’s also a member of Brighton collective The E.M.E.. Brought up on the clubs and pirate radio of London, Peter now makes Brighton his home where he teaches music technology at DV8 Sussex. 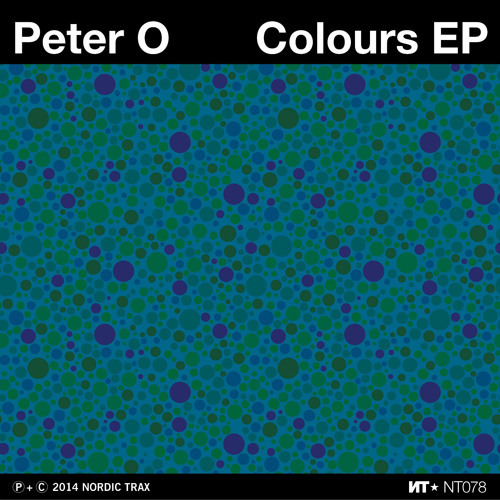 :::::::::::::::::::::::::::::::::::::::::: Peter O 'Colours EP' is out October 7, 2014. All tracks written & produced by Peter O, except track 3 written & produced by Peter O & J-Felix. Published by Nordic Trax (Socan). Copyright 2014 Nordic Trax. :::::::::::::::::::::::::::::::::::::::::: Radio: BBC Radio1, Rinse FM, Sub FM, DJ Mag Italia, 6am At The Garage, WBAI-NY, WHCR-Harlem, Turned-On Podcast :::::::::::::::::::::::::::::::::::::::::: DJ SUPPORT Maya Jane Coles: Great E.P. from Peter O Martin Landsky: I was always a big fan of Nordic Trax. Great to see the guys are still top notch... Colours is my favourite here, classy Waifs & Strays: Touch is quality! Whole EP is in fact...lovely deep vibes Catz ‘N Dogz: Whoop! 5/5 Roberto Rodriguez: Very nice ep from Peter! 'Keep It Up' got me hooked! Christian Martin: Colours is SWEET Joris Voorn: Keep it up is fab! Chopstick: Beautiful release.. especially keep it up! Groove Armada: Lovely lovely stuff. 5/5 Ben Gomori: Keep It Up is sick. Playing on the show. Jef K: very nice EP !! thanks a lot Iron Curtis: colours is a fine piece of house music.nice one! Asad Rizvi: Mr O is going from strength to strength. Loving Touch! Philippe Autuori: Touch is a pure bliss for disco lovers Nacho Marco: Serious deep tracks here, full support! DJ FOster: Amazing EP! Will support for sure! Jason Hodges: quality EP...Keep It Up is my choice cut! 10/10 Sandro Bianchi: sweet & classy! love the whole release! Matt Caine: Deep Vibes on this one! Lovin the vocal cuts on Touch Murray Richardson: Nice deepness from Peter O...really like the Tea Time track and Touch is for me the stand out track on the EP...great stuff!